1. Preheat the oven to 200ºC, gas mark 6. Steam the peas, leeks and spinach according to pack instructions. 2. Spray a little oil into an 18cm-base, non-stick, ovenproof frying pan. In a medium bowl, mix together the cooked vegetables, torn basil and beaten eggs. Season with freshly ground black pepper and pour into the frying pan. Scatter with the cheese and cook over a low heat for 10 minutes or until beginning to set. 3. Bake the frittata in the oven for another 10-15 minutes until puffed up, golden and set. Turn out of the pan and leave to cool slightly before cutting into wedges. 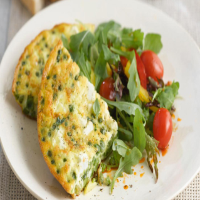 Serve with the salad and crusty bread.